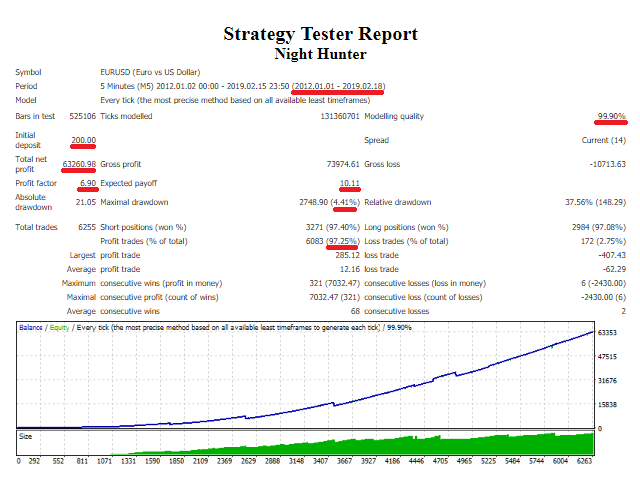 Night Hunter Expert Advisor is a fully automated Night Scalper Trading System. RSI, Stochastic and ATR indicators are used for entrance. Order open time is always between 23:00 - 01:00 GMT (London Time). The Expert was tested in 7 years of EURUSD historical real tick data. Please download it and test it yourself. The Night Hunter aims to keep the trade results stable. Broker's Winter GMT Offset: Your broker's timezone in winter (Default +2). If you are not sure about these parameters please ask your broker. Broker use Daylight Saving Time: If your broker's time is observed DST, choose "On". If you are not sure about these parameters please ask your broker. Auto Lot: Enable/disable auto lot calculation. If Auto Lot is true, the expert will allocate your selected percentage of balance. Allocate Percentage of Balance (0-100): When Auto Lot is enabled and this value is 80, it means expert will use 80% of your balance for trading. This value must be between 0-100. Max Orders: It shows maximum orders on one direction at the same time. If it is 6, it means expert can open maksimum 6 buy and 6 sell orders at the same time. Spread Filter - Enable: If this is enabled, spread is checked everytime before enter any order. Hello, My name is Ozkan. I am a Quant Trader (Algorithmic Trading Software Developer). I have been developing Algorithmic Trading Systems since 2008. I usually work on major currencies, CFD and Futures. I am interested in Statistical Arbitrage and Signal Processing on any market’s data. My main goals are developing and selling new strategies for the financial markets. Do you like this product? Please write a review. Good EA and helpful author. I like this expert adviser. It is a steady winner. I would recommend.